The bucolic setting of this central Russian town contributes to the sense of going back in time brought about by its historic architecture. This architectural heritage display rests on land formerly occupied by the cave Monastery of St. ​Demetrius of Thessaloniki (in Russian St. Dimitry Solunsky), founded in the late 11th century by pioneer monks from the Monastery of the Caves in Kiev. The monastery was closed in 1764 during Catherine the Great’s secularization of monastery holdings and reorganization of the monastic system. Its wooden main church, dedicated to St.Demetrius​, was demolished ​almost a decade later, ​in 1773, only to be rebuilt in brick for parish use. The monastery also had a smaller Church of St. George, built of brick in 1751 and subsequently used by the parish for worship in the winter. Both structures were razed in 1930. Without a rail link and served by poor country roads, bucolic Suzdal and its many ancient churches and monasteries existed as something of a time capsule until the 1960s. During that decade, plans were formulated to convert this unique environment into a national preserve and a magnet for cultural tourism. In 1967, Suzdal was officially designated by the Soviet government as a historical heritage site. An important component of this master plan was the creation of a group of wooden structures brought from villages in the area surrounding Suzdal. The concept was developed and supervised by Valery Anisimov, ​an accomplished specialist in architectural preservation. Despite decades of neglect, a number of representative examples of traditional wooden architecture still existed in neighboring districts and were eventually transported to the museum site. How to get there: Buses for Suzdal leave every half hour from Moscow's Shchyolkovsky Station. The cost of a ticket is about $5 and the journey takes around 4.5 hours. The north and south barrel gables on the main roof support delicate cupolas clad in aspen shingles. Each cupola supports an extended wooden cross. The roofs of the upper tiers have their own diminutive gables, and the tower culminates in a wooden cupola with a tall cross.​ The east side ​of the church ​is the most complex and contains not only the main altar in the center, but also two side spaces for the sacraments and the clergy’s vestments (known as the prothesis and the diakonikon). On the opposite side of the church, a vestibule and raised entrance extend on the west of the base structure. The distinctive appearance of the Transfiguration Church is ​derived from the form of its walls, which are built of squared logs tightly joined by a type of dovetail. (Usually the logs are left in their round form joined with a simple notch.) It is possible that this labor-intensive construction practice was required to support the bold vertical design of the tower. Every aspect of this tiered structure combines the functional with the aesthetic. Inside, the c​hurch has a white ​neoclassical ​icon screen with a number of surviving icons. The iconostasis ascends into the first octagonal tier of the tower and culminates ​with a gilded carving of Christ in Glory. In a highly unusual feature, the bare log surfaces of the octagonal tiers are adorned with large depictions of saints painted in oils. A short walk from the Transfiguration Church is the Church of the Resurrection from the village of Patakino (Kameshkovo District). This rustic structure was built in 1776 and served ​almost two centuries ​as a cemetery ​shrine. In 1969-1970, the church was disassembled at Patakino and rebuilt at the museum site. Although its design is simpler than the tower form of the Transfiguration Church, the Patakino church has a visual richness of its own. The main structure of the Resurrection Church ascends from a cube to an octagonal top that culminates in a slanted roof with a small cupola and cross. On the east side is an elongated apse (containing the altar) with ornamental carving along the peak of the roof. On the west side, the Resurrection Church has a vestibule that ends with a bell tower over the main entrance. This linear arrangement of components was typical of brick parish churches in the 17th and 18th centuries. 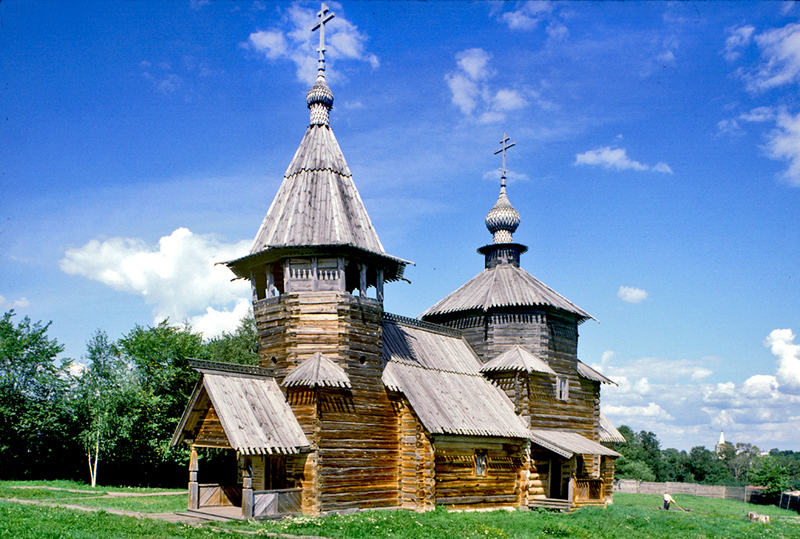 Like the church from Kozlyatevo, the walls of this church were built of squared pine logs with dovetail joints. The interior has a preserved icon screen and is occasionally used for worship. Around the two churches is a small collection of log houses (izba) reassembled at the museum. In typical Soviet practice, the houses were defined by the social strata of the peasants who inhabited them. They include: a 19th-century one-story house with decorative carved boards and an attic room from the village of Ilkino (Melenki district). Adjoining the izba is a wooden gate that opened onto a fenced courtyard with sheds and other structures. Considerably larger is a two-story house with a steep roof and attic room from the village of Log (Vyazniki District). Although the windows have simple shutters, the roof endboards are elaborated carved. It, too, has a gated courtyard. The house interior has an informative display of the use of living space within such houses. Even more spacious is a late 19th-century house with an iron roof and a half upper story (mezonin) from the village of Tyntsy (Kameshkovo District). This house shows certain urban influences in design. One of the newest additions to the museum is the house of the Agapov merchant family. Built in the late 19th century, the house remains on its original site and has been incorporated into the museum territory. The brick ground story housed a smithy and now displays blacksmith’s tools and crafts. The wooden upper story, which contained the family’s living space, now has a display of a typical merchant house interior. On a rise at the top of the park are two tall windmills of stout pine logs from the village of Moshok (Sudogda District). The top of each mill rotates to catch the prevailing winds that power the complex grinding mechanism. Such village windmills would have belonged to prosperous peasants with the means to erect the structure. The third wooden church on display at the Suzdal museum complex is located back across the Kamenka in the shadow of the great Nativity Cathedral. Dedicated to St. Nicholas, the small wooden church of simple design was built in 1766 at the village of Glotovo near Yurev-Polsky. In 1960 the church was moved to Suzdal as the first example of traditional wooden architecture to be displayed at the future museum complex. Traditions of wooden architecture still exist in Suzdal, as is evident from the town’s many well-maintained log houses with decorative window surrounds—part of the living heritage of an ancient place.